Jetstar have a $8.50 minimum credit card booking fee for paying using a credit card. As you can guess, I love paying for things by credit card and earning points, but I don’t love paying nearly an extra 10% on a $90 airfare to do so. 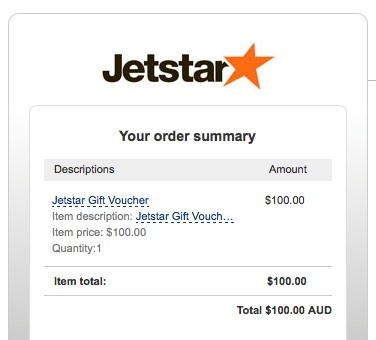 It turns out that you can pay for your Jetstar flight using Jetstar gift vouchers, which are available in increments including $100, $200, $300 and $500. 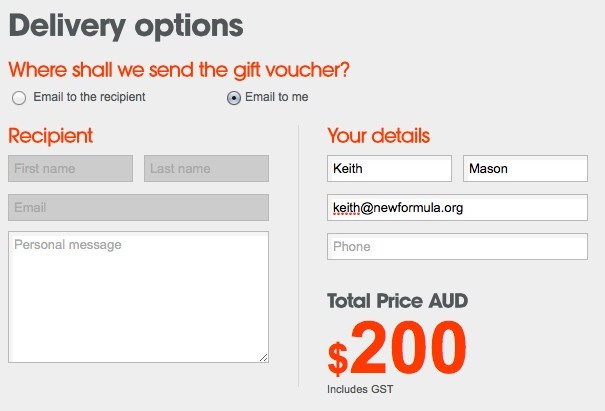 Gift vouchers have to be purchased using Paypal, with I assume some kind of exclusive commercial deal between Paypal and Jetstar for this – but there’s no fee for purchasing vouchers, and you can then apply one to your online booking. 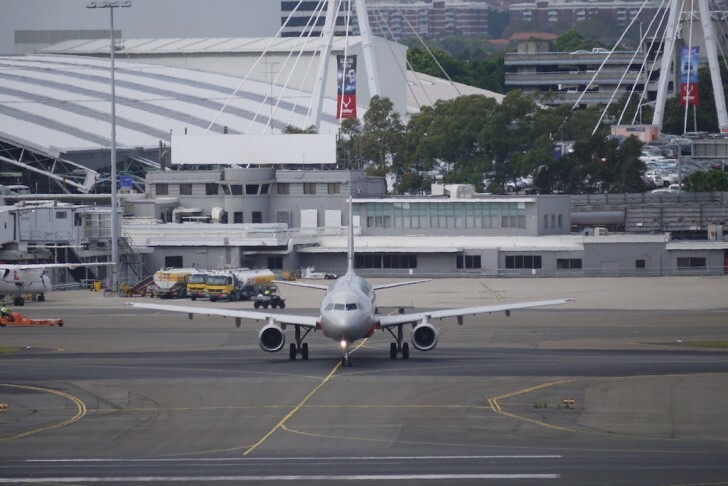 The method is pretty simple – only one Jetstar voucher can be applied per booking, so you’ll need to choose the closest voucher value under the flight cost you are purchasing. 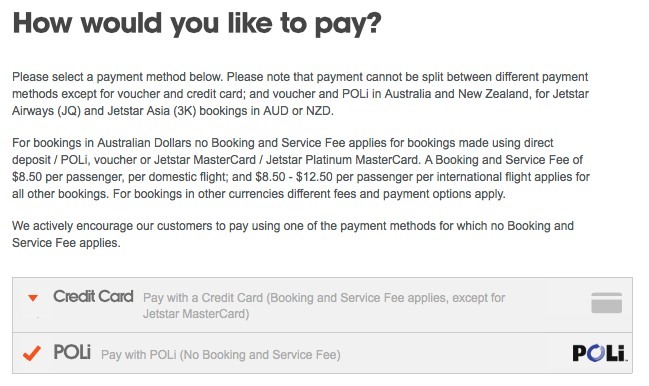 You’ll then have to pay the difference using an option which doesn’t incur a fee – either POLI or Jetstar Mastercard. You can only use a voucher for one booking, so any overage can’t be applied to another booking, it will be lost, hence the need for a copay. Once you have the voucher – it will show up as a PDF including a long numeric code to input during the flight payment process – you can then go about making your flight booking. When you get to the checkout screen, you can apply your voucher number and the available payment options to then pay the reminder of the cost change to look like the below. At this point, I then pay by POLI straight out of my bank account for the overage. I made 3 bookings on Jetstar yesterday, one for $120, one for $220, and one for $480. The last one was the ‘worst’ to use with this technique, as it meant buying a $300 voucher and paying the $180 copay from my bank account. That’s still better than shelling out $8.50 on Jetstar’s credit card booking fee just for the privilege of paying by credit card. The whole process took probably about 5 minutes longer than just making the booking directly and paying the fee, so time well spent. Question, do you void your credit cards complimentary travel insurance by paying for a flight this way? i.e. not paying for the flight using your credit card? as you technically paid for the flight using a gift voucher? Probably. I mean, it would be a win if they did cover but I can see where you are coming from in thinking they may not. But worth checking with your specific card provider if you rely on that insurance. Mobile site doesn’t charge fees on debit mastercard only as there’s no POLI option for mobile. Marc-Philippe I’ll always try and get 3c of value or more out of a point when redeeming – but if buying points outright, then value has to be around 1/2 that to work for me. This could save some more time. The thing is though Debit Mastercards are rare 🙂 I know of ME Bank and CBA offering them but none of the other majors. 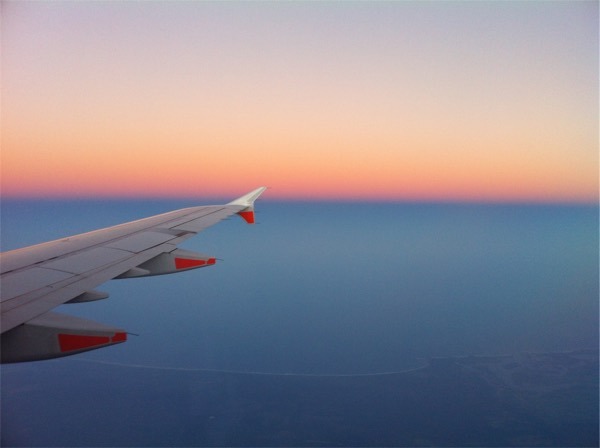 If you still wanted to earn cc rewards points and avoid the Jetstar service charge (without having to buy a single use Jetstar gift voucher and have to split payment you could purchase a prepaid debit Mastercard and use it on Jetstar’s mobile site. I believe Qantas Cash is a Debit Mastercard… could work. However I still think this would all take the same amount of time as just buying a voucher using Paypal (which was fast) and then just purchasing online/on desktop as usual, paying the remainder with POLI. Other options make sense for substantial bookings – e.g. $7/800+ as the largest voucher is only $500. Wow I’m overvaluing by a lot. Usually around 1-1.5c. The (newly reduced) earn of 800 points certainly isn’t worth the pack alone, but when you’re chasing status credits to keep lounge access, I find the 10 SC’s for $22 (from memory) to be acceptable. Agreed, what value do you put on points? preference and how you value points and status credits – not easy to generalise. QFF pack is important to me personally, and $8.50 fee is per person, per flight – so $34 for 2 people return. Worth the effort for me. Best to do price matching with jetstar – can use credit card, amex and no fees plus 10% off competitors price! Right, but you wouldn’t earn Qantas points / status credits on the price matched fare (AFAIK). We’re a family of six…are there vouchers higher than $500? Can more than one voucher be applied per booking? Unfortunately not – so you can’t mix and match Jetstar voucher denominations to get closer to the fare price.